Why is it so important to make up names that include judgemental qualifiers? Are all other t-tests (including every future proposal) "imperfect"? You write that there is no "perfect" test. So whats the point of calling it that way? I think "a bank of two-sample difference tests" describes much better what you do. The qualifier "difference" is crucial. If the relevant ES is a quotient or some more complex model is needed then your perfect test will provide misleading results. As you probably know by now, I'm opposed to one-click solutions. One-click solutions usually don't mean less time spent with data analysis = more free time for other stuff. Rather the time for data analysis is held constant and the number of one-click analyses of the same dataset increases = data dredging. thanks for your comment - I was affraid no one would be critical about this! The 'perfect t-test' name is pure PR. It draws attention. Remember I'm trying to convince people to use it, because I think it will improve the way they report statistics, so everything is allowed to draw them away from SPSS to R (surely, you must agree?). If it leads to more data dredging - I don't know. It's not something this is meant to solve - there is pre-registration for that, and I invested some time in a special issue on pre-registered replications to combat results due to data dredging. One thing at a time! > I was affraid no one would be critical about this! Haha, you can always count on me in this regard. In a previous post, you wrote "It shows that when interpreting p-values, it is important to take the power of the study into consideration.". I completely agree, that's why I regret the absence of power calculation. In any case your perfect t-test is terrific! Thanks! The power of a study is not a statistical inference - it requires knowledge about the true effect size, which requires a theoretical model. So I don't see how my script could do that. Instead, after you get the p-value, a human needs to take power into account. Pos-hoc power is not useful for that, as I explained on this blog. Isn't it possible to add a functionality to calculate power based on the assumed true effect size à la pwr.t.test? Oops... I didn't click 'reply', sorry. Excellent post! I will study it meticulously. 1) Why you, EJ Wagenmakers and others seem to prefer Bayes Factor as the representant of Bayesian inference, if there is some advocacy against it (e.g., http://papers.ssrn.com/sol3/papers.cfm?abstract_id=2606016)? 3) I also believe that we (psychologists) should be more well-informed of new statistical methods that surpass the traditional ones (I use only Welch's test since I read an older post of yours). But, being our field slow in updating, do you think that a paper reporting your "perfect t test" would have the same publication's probability than the same paper reporting a common t test? If not, how to overcome this barrier? Thanks for the script - such kind of tools made by professional statistician can really motivate us (backwoods-biologists) to learning R. Special thanks for clear and comprehensive text accompanying results - i think script really earn this "perfect" in the title. Any plans/possibility to write similar script and supplementary text for few groups comparison (OW-ANOVA, K-W, some modern randomization/permutations stuff)? PS. I tried independent t-test version. There is typo "whih" in the text. In Robust statistics section "Figure 1. 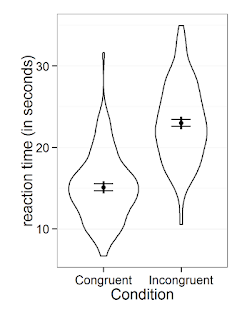 Means and 95% CI, and violin plot" only first part of fig. 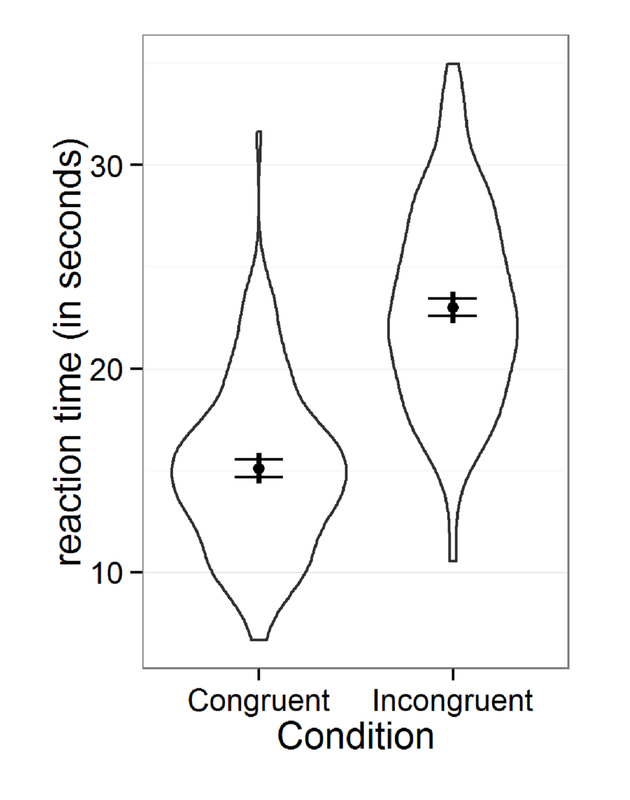 is plotted (no violin plot - and no warning message in R output). Just a feedback to let your improve the code/text - thank you very much for you work! Still playing with script, now on my own data - so a bit more feedback. The statement "This script uses the reshape2 package to convert data from wide to long format" seems to be wrong - user need to use melt() by their own. The "ppnr" column (for stable tab-delimited input?) may be omitted. The color highlighting of user variables and main results in the output text is much desired. You forgot the Keselman article in the references. Nice work though! FYI: package ‘yuenbt’ is not available (for R version 3.2.3), this breaks the script. Thanks for informing me - I'm still thinking about how this script will be shared, finally, and whether I will maintain it, and if so, how. I'm sure it took you a lot of time to prepare this and I'm sure it would be very useful for a number of people. However, I think you might be running the risk of creating something, you'd have to keep on updating constantly (library/R updates; not to mention answering numerous questions and requests), so perhaps a tutorial for doing all those things you script aims to achieve would be less time consuming and serve an educational purpose at the same time. After all, those who would be able to work around potential bugs, won't really use it; R newbies will be unable to use a broken version, so I guess R's life-cycle renders the task of maintaining the perfect t-test script almost impossible without crowd sourcing its maintenance. As an R newbie just discovering this script, I am getting the 'yuenbt' error— any easy workarounds? I've fixed the yuenbt error (I think - the script now runs on my computer). So far only for the independent t-test. If I have more time, will fix it for the dependent t-test as well.